Compliance and governance are taking a high profile in current multilateral environmental negotiations. As this issue of Linkages Update reports, countries’ compliance was a major topic at last week’s Rotterdam Convention conference, although no final agreement was reached. Meanwhile, parties’ long-term compliance with their Kyoto Protocol pledges will be an underlying theme at the upcoming UN climate change conference in Nairobi. Geneva, 14 October 2006—The Conference of the Parties to the Rotterdam Convention on Prior Informed Consent (PIC) Procedure for Certain Hazardous Chemicals and Pesticides in International Trade has deferred a decision on whether to make chrysotile asbestos subject to the PIC procedure until its fourth session in October 2008. The meeting, which convened in Geneva, Switzerland, from 9-13 October 2006, also did not reach agreement on the mechanisms and procedures for non-compliance, but progress was reported on issues related to sustainable financing, capacity building and synergies between the chemicals and waste conventions. Full Story. 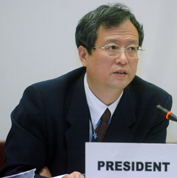 Photo: Yue Ruisheng, PIC COP-3 President. 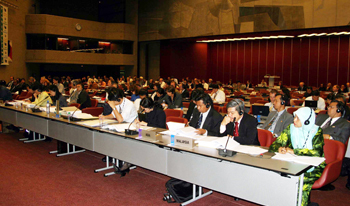 Geneva, 7 October 2006—The Standing Committee of the Convention on International Trade in Endangered Species of Wild Fauna and Flora (CITES) has agreed to designate Japan as a trading partner for the one-off sale of ivory stockpiles from Botswana, Namibia and South Africa, but not to proceed with the sale at this point. Additional decisions taken at the 2-6 October 2006 meeting in Geneva, Switzerland, included approval of the Secretariat’s estimated expenditures for 2006, deferral of consideration of trade in tigers until COP-14, and agreement to not revise the 2006 caviar export quotas. Full Story. Photo: On 2 October, SC-54 opened in Geneva with record attendance of more than 300 delegates.